I was recently gifted with a home-brewed bottle of sour black cherry beer. I am not a big beer drinker, but I do enjoy the occasional bottle of ice cold Shiner Bock or Tecate con lima. So when my friend and her husband started brewing beer, I was clinically interested and somewhat curious about it and could totally relate to her enjoyment of it, given my own obsession with home-made anything, but I could understand why she did not feel a pressing need to present me with any samples of her efforts. So I was quite thrilled when she mentioned to me the last time we were planning to get together that she and some friends had made a brew she was pretty sure I would like and would bring me a bottle. I was super pleased, since I have been wanting to taste what she's been making for a while. I brought it home and put it in the refrigerator and thought about what I wanted to do with it. Aside from drinking it, of course. It had a lovely dark brown tone and I decided the sour cherry would best be complemented by meat. Pork always goes well with fruit and a had some shoulder chops in the freezer so I defrosted them and braised them in a little bit of the beer. The result was a dark, tangy luscious sauce with just a hint of the cherry that added a sweet tone without being sweet. It was even better than the chops I braised in the Shiner Bock which I absolutely love. The rest of the beer I drank with dinner. It was crisp and smooth with the deep tang of the black cherries. It was a winner for sure. I hope she will make more of it! 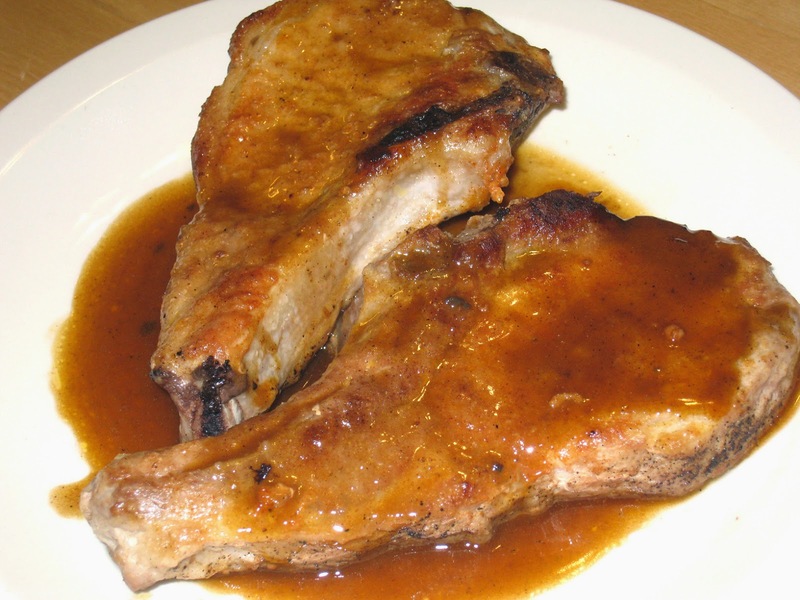 You can find the recipe for braising pork chops in beer here. Just use whatever brand you have on hand, and enjoy.